(a) Using SST and a steel plate, install a new rear drive shaft dust cover to the rear drive shaft inboard joint assembly. The rear drive shaft dust cover should be completely installed. Be careful not to damage the rear drive shaft dust cover. 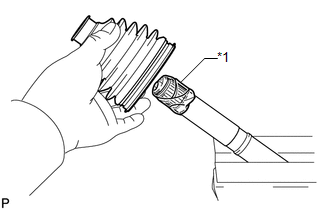 (a) Wrap the spline of the drive shaft with vinyl tape to prevent the boot from being damaged. 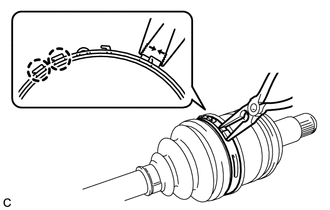 (c) Pack the rear drive outboard joint shaft assembly and rear drive shaft outboard joint boot with grease from the boot kit. (a) Hold the rear drive shaft assembly lightly in a vise between aluminum plates. (b) Secure the rear drive shaft outboard joint boot clamp onto the boot. 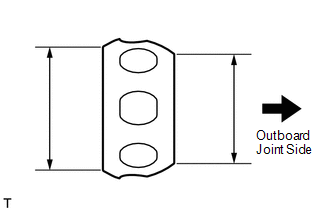 (c) Place SST onto the rear drive shaft outboard joint boot clamp. 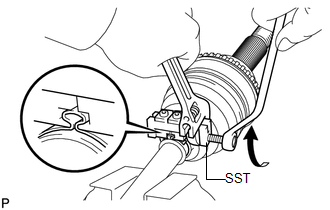 (d) Tighten SST so that the rear drive shaft outboard joint boot clamp is pinched. 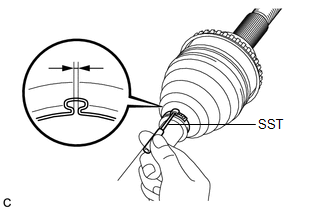 (e) Using SST, inspect the clearance of the rear drive shaft outboard joint boot clamp. If the measured value exceeds the specified value, retighten the clamp. (a) Using a screwdriver, install a new No. 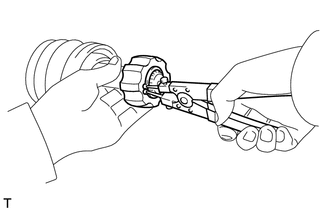 2 rear drive shaft outboard joint clamp as shown in the illustration. Do not damage the outboard joint boot. 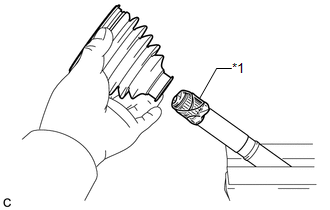 (a) Wrap the spline of the outboard joint shaft with vinyl tape to prevent the boot from being damaged. (c) Install the ball cage to the outboard joint shaft. Install the ball cage with its smaller inner diameter side facing the outboard joint. (d) Align the matchmarks placed before removal and install the inner race to the rear drive outboard joint shaft assembly using a brass bar and a hammer. Be careful not to damage the inner race. 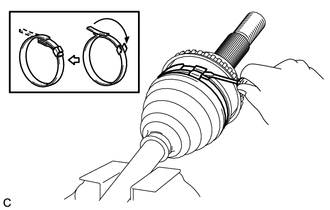 (e) Using a snap ring expander, install a new shaft snap ring. (f) Align the matchmarks placed before removal and install the cage to the inner race. (g) Install the 8 balls with grease to the inner race. Be careful not to drop the balls. Apply grease onto the balls to keep them from falling. 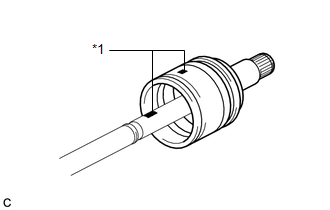 (h) Pack the inboard joint shaft and boot with grease. (i) Align the matchmarks and install the rear drive shaft inboard joint assembly to the rear drive shaft outboard joint shaft assembly. 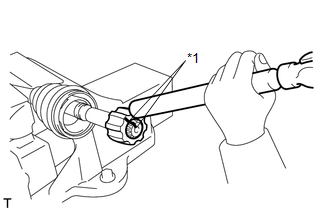 (j) Using a screwdriver, install the drive shaft snap ring to the rear drive shaft inboard joint assembly. 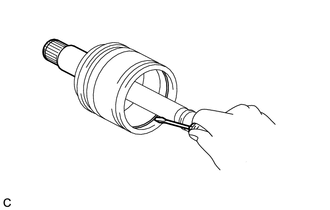 (a) Install the rear drive shaft inboard joint boot to the outboard joint shaft. 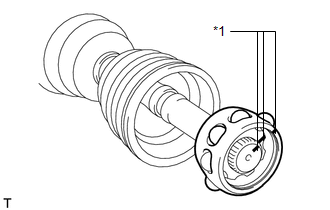 (b) Check whether the drive shaft dimensions are within the following specifications. 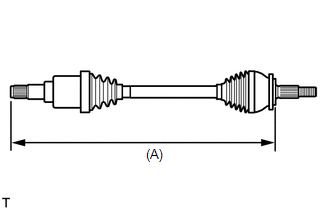 The following table shows the dimension (A) of the drive shaft. (a) Using needle-nose pliers, engage the 2 claws to install a new No. 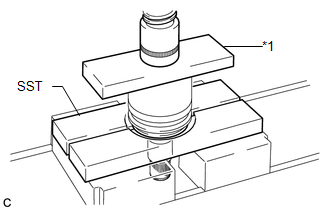 2 rear drive shaft inboard joint clamp as shown in the illustration. Perform the same procedure as for the No. 2 rear drive shaft inboard joint boot clamp. (a) Install a new rear drive shaft snap ring.